Item description: An ordinance, passed by the North Carolina Secession Convention, to create a flag for the State of North Carolina. The flag included the dates of the Mecklenburg Declaration of Independence and the date the state seceded from the Union–the same month and date, 86 years apart. AN ORDINANCE IN RELATION TO A STATE FLAG. 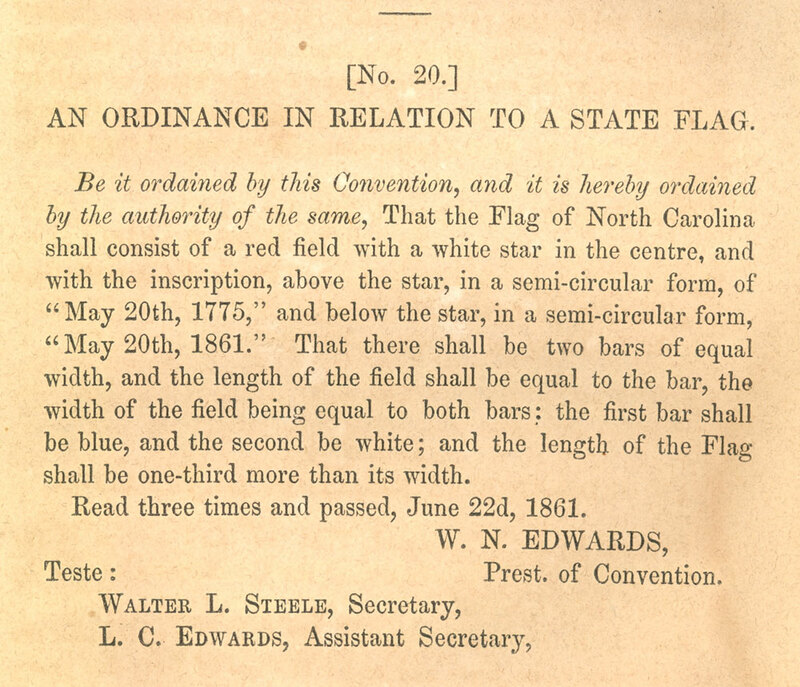 Be it ordained by this Convention, and it is hereby ordained by the authority of the same, That the Flag of North Carolina shall consist of a red field with a white star in the centre, and with the inscription, above the star, in a semi-circular form, of “May 20th, 1775,” and below the star, in a semi-circular form, “May 20th, 1861.” That there shall be two bars of equal width, and the length of the field shall be equal to the bar, the width of the field being equal to both bars; the first bar shall be blue, and the second be white; and the length of the Flag shall be one-third more than its width. Read three times and passed, June 22d, 1861. This entry was posted in North Carolina Collection and tagged flag, North Carolina, ordinances, Secession Convention. Bookmark the permalink.